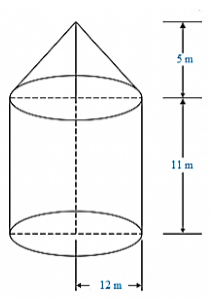 Consider a tent cylindrical in shape and surmounted by a conical top having height 16 m and radius as common for all the surfaces constituting the whole portion of the tent which is equal to 24 m. Height of the cylindrical portion of the tent is 11 m. Find the area of Canvas required for the tent. 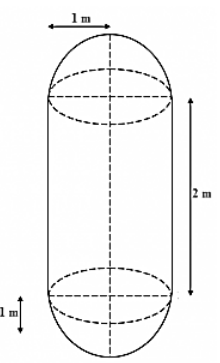 The diameter of the cylinder given in the question is 24 m.
Consider a Rocket. Suppose the rocket is in the form of a Circular Cylinder Closed at the lower end with a Cone of the same radius attached to its top. The Cylindrical portion of the rocket has radius say, 2.5 m and the height of that cylindrical portion of the rocket is 21m. The Conical portion of the rocket has a slant height of 8m, then calculate the total surface area of the rocket and also find the volume of the rocket. Let, h be the height of the conical portion in the rocket. 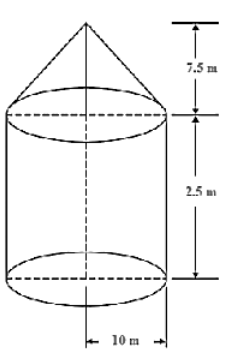 Take a tent structure in vision being cylindrical in shape with height 77 dm and is being surmounted by a cone at the top having height 44 dm. The diameter of the cylinder is 36 m. Find the curved surface area of the tent. Consider L as the Slant height of the Cone. A toy is in the form of a cone surmounted on a hemisphere. The diameter of the base and the height of the cone are 6 cm and 4 cm, respectively. Determine the surface area of the toy. A solid is in the form of a right circular cylinder, with a hemisphere at one end and a cone at the other end. The radius of the common base is 3.5 cm and the height of the cylindrical and conical portions are 10 cm and 6 cm, respectively. Find the total surface area of the solid. (Use π = 22/7). A toy is in the shape of a right circular cylinder with a hemisphere on one end and a cone on the other. The radius and height of the cylindrical parts are 5cm and 13 cm, respectively. The radii of the hemispherical and conical parts are the same as that of the cylindrical part. Find the surface area of the tor if the total height of the toy is 30 cm. Consider a cylindrical tub having radius as 5 cm and its length 9.8 cm. It is full of water. A solid in the form of a right circular cone mounted on a hemisphere is immersed in tub. If the radius of the hemisphere is 3.5 cm and the height of the cone outside the hemisphere is 5 cm. Find the volume of water left in the tub. To find the volume of the water left in the tube, we have to subtract the volume of the hemisphere and the cone from the volume of the cylinder. Therefore, the volume of water left in the tube is 616 cm3. A circus tent has a cylindrical shape surmounted by a conical roof. The radius of the cylindrical base is 20 cm. The height of the cylindrical and conical portions is 4.2 cm and 2.1 cm. Find the volume of that circus tent. A petrol tank is a cylinder of base diameter 21 cm and length 18 cm fitted with the conical ends, each of axis 9 cm. Determine the capacity of the tank. A conical hole is drilled in a circular cylinder of height 12 cm and base radius 5 cm. The height and base radius of the cone are also the same. Find the whole surface and volume of the remaining Cylinder. Let us consider, L as the slant height of the conical hole. A tent is in the form of a cylinder of diameter 20 m and height 2.5 m surmounted by a cone of equal base and height 7.5 m. Find the capacity of tent and the cost of canvas as well at a price of Rs.100 per square meter. Consider a boiler which is in the form of a cylinder having length 2 m and there’s a hemispherical ends each of having a diameter of 2 m. Find the volume of the boiler. Since, at each of the ends of the cylinder, hemispheres are attached. A vessel is a hollow cylinder fitted with a hemispherical bottom of the same base. The depth of the cylinder is 14/3 and the diameter of the hemisphere is 3.5 m. Calculate the volume and the internal surface area of the solid. Consider a solid which is composed of a cylinder with hemispherical ends. If the complete length of the solid is 104 cm and the radius of each of the hemispherical ends is 7 cm. Find the cost of polishing its surface at the rate of Rs. 10 per dm2. The cost of polishing the whole surface of the solid is Rs. 457.18. A cylindrical vessel of diameter 14 cm and height 42 cm is fixed symmetrically inside a similar vessel of diameter 16cm and height of 42 cm. The total space between the two vessels is filled with Cork dust for heat insulation purposes. Find how many cubic cms of the Cork dust will be required? Therefore, Volume of the vessel = V = 1980 cm3 = Amount of cork dust required. A cylindrical road roller made of iron is 1 m long. Its internal diameter is 54 cm and the thickness of the iron sheet used in making roller is 9 cm. Find the mass of the road roller if 1 cm3 of the iron has 7.8 gm mass. Let us assume that the outer radii of the cylindrical road roller be R.
A vessel in the form of a hollow hemisphere mounted by a hollow cylinder. The diameter of the hemisphere is 14 cm and the total height of the vessel is 13cm. Find the inner surface area of the vessel. The difference between outside and inside surface areas of the cylindrical metallic pipe 14 cm long is 44 dm2. If pipe is made of 99 cm2 of metal. Find outer and inner radii of the pipe. Let, inner radius of the pipe be r1. Radius of outer cylinder be r2. Difference between the outer and the inner surface area is 44 dm2. Consider a solid iron pole having cylindrical portion 110 cm high and the base diameter of 12 cm is surmounted by a cone of 9 cm height. Find the mass of the pole. Assume that the mass of 1 cm3 of iron pole is 8 gm. A solid toy is in the form of a hemisphere surmounted by a right circular cone. Height of the cone is 2 cm and the diameter of the base is 4 cm. If a right circular cylinder circumscribes the toy, find how much more space it will cover? Consider a solid consisting of a right circular cone of height 120 cm and radius 60 cm standing on a hemisphere of radius 60 cm, is placed upright in the right circular cylinder full of water such that it touches bottoms. 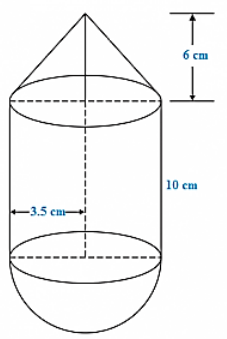 Find the volume of the water left in the cylinder, if radius of the cylinder is 60 cm and its height is 180 cm. A hemispherical depression is cut from one face of a cubical wooden block of the edge 21 cm such that the diameter of the hemispherical surface is equal to the edge of the cubical surface. Determine the volume and the total surface area of the remaining block. A boy is playing with a toy which is in the form of a hemisphere surmounted by a right circular cone of the same base radius as that of the hemisphere. 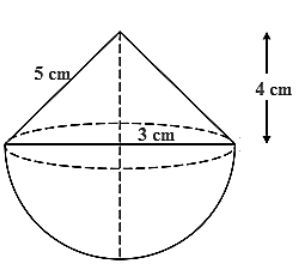 If the radius of the base of the cone is 21 cm and its volume is 2/3 of the volume of the hemisphere. Calculate the height of the cone and surface area of the toy. Consider a solid which is in the form of a cone surmounted on hemisphere. The radius of each of them is being 3.5 cm and the total height of the solid is 9.5 cm. Find the volume of the solid. A wooden toy is made by scooping out a hemisphere of same radius from each end of the solid cylinder. If the height of the cylinder is 10 cm, and its base is of radius 3.5 cm, find the volume of the wood in the toy. The largest possible sphere is carved out of a wooden solid cube of side 7 cm. Find the volume of the wood left. V1 = 3.53 …. E – 1. From a solid cylinder of height 2.8 cm and diameter 4.2 cm, a conical cavity of the same height and same diameter is hollowed out. Find the total surface area of the remaining solid. 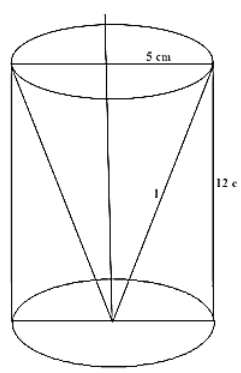 The largest cone is carved out from one face of the solid cube of side 21 cm. Find the volume of the remaining solid. The radius of the largest possible cone is carved out of a solid cube is equal to the half of the side of the cube. The height of the cone is equal to the side of the cone. V1 = 10.53 ....  E-1. A solid wooden toy is in the form of a hemisphere surmounted by a cone of the same radius. The radius of the hemisphere is 3.5 cm and the total wood used in the making of toy is .Find the height of the toy. Also, find the cost of painting the hemispherical part of the toy at the rate of Rs. 10 per square cm. How many spherical bullets can be made out of a solid cube of lead whose edge measures 55 cm and each of the bullet being 4 cm in diameter? Let, the total number of bullets be a. Consider a children’s toy which is in the form of a cone at the top having a radius of 5 cm mounted on a hemisphere which is the base of the toy having the same radius. The total height of the toy is 20 cm. Find the total surface area of the toy. A boy is playing with a toy conical in shape and is surmounted with hemispherical surface. Consider a cylinder in with the toy is inserted. The diameter of cone is the same as that of the radius of cylinder and hemispherical portion of the toy which is 8 cm. The height of the cylinder is 6 cm and the height of the conical portion of the toy is 3 cm. Assume a condition in which the boy’s toy is inserted in the cylinder, then find the volume of the cylinder left vacant after insertion of the toy.